Click the following links to learn more about WISADDS and ASD. What is the Autism and Developmental Disabilities Monitoring (ADDM) Network? The Centers for Disease Control and Prevention (CDC) is currently funding surveillance activities in 10 states, including Wisconsin, to develop programs to monitor the prevalence of autism spectrum disorders (ASDs) and other developmental disabilities. The goal of the ADDM Network is to provide comparable, population-based estimates of the prevalence of autism and other developmental disabilities at different sites over time. The combined data from the various ADDM sites can help inform researchers about the possible causes of ASDs or factors contributing to the apparent increase in ASD diagnoses. In addition, the ADDM Network seeks to conduct education and outreach activities to increase public awareness and lead to improvements in how individuals with ASDs are identified and receive appropriate interventions. For more information, please see: www.cdc.gov/autism. What is the Wisconsin Surveillance of Autism and Other Developmental Disabilities System (WISADDS)? WISADDS is a multisource investigation to monitor the number of 8-year-old children in the population with an ASD, or cerebral palsy (CP), or both. This surveillance system will help establish an accurate count of the number of children and families residing in Wisconsin affected by these disorders. This project is a collaboration between the Wisconsin Department of Health Services and investigators from the Waisman Center and Department of Population Health Sciences of the University of Wisconsin-Madison. WISADDS is a joint undertaking with CDC and other state partners, agencies and organizations that serve children with developmental disabilities and their families. WISADDS also conducts surveillance of 4-year-old children in the population with an ASD. 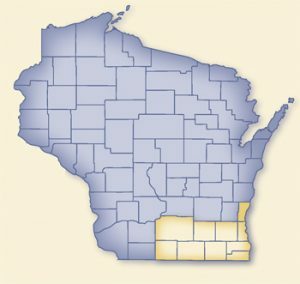 What part of Wisconsin is in WISADDS? The study covers the following counties of southeastern Wisconsin — Dane, Green, Jefferson, Kenosha, Milwaukee, Ozaukee, Racine, Rock, Walworth, and Waukesha. Approximately 35,000 babies are born in these counties each year, and about half of the state’s population resides in these counties. WISADDS is also monitoring the number and characteristics of 4-year old children with an ASD in the counties of Rock and Dane. How many people 3 through 21 years of age are classified as having autism by the Wisconsin Department of Public Instruction? During the 2013-2014 school year, 10,238(1.03%) of Wisconsin’s public and private school students were classified as having autism and receiving special education services. The number of children residing in Wisconsin and receiving special education services for autism more than tripled from 2002 through 2014. How common are ASDs among children who live in Wisconsin? The 2014 surveillance year data found that 14.1 per 1,000 children were identified with an ASD. From the first surveillance year (2002) through 2014, identified ASD prevalence has more than doubled in Wisconsin. You can read the report in its entirety here. The corresponding community report is available for download from the CDC website.